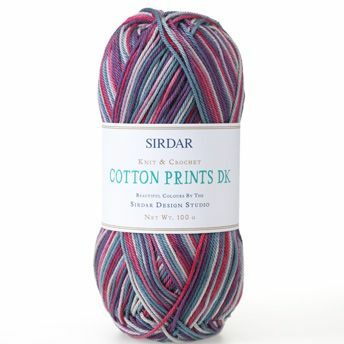 Sirdar Cotton Prints DK is from the same family as our much-loved Cotton 4 Ply and Cotton DK yarns. This vibrant yarn comes in 8 tonal shades, with modern mixes of pinks, blues and oranges, as well as softer mixes of browns and creams. The Sirdar design team have created 8 leaflets with beautiful summery styles for women, there are vests with eyelet details, fan and feather tops and a trendy crochet top with rounded hem. There is also a range of stylish bags that will take you from the beach right through to cocktails.